You should wear a swimsuit under your clothing and you should bring a towel, warm clothing and a jacket. 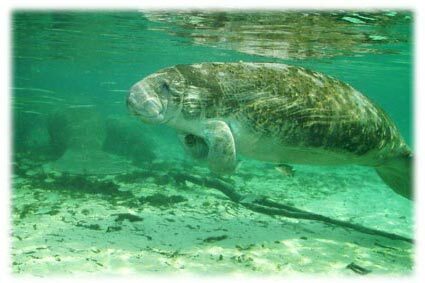 You should arrive at or before 8:00 AM for the Manatee Guided Snorkel Tours. When do we return back to the dock? No later then 11:00 AM. We are located on the premises of the best western on US 19 all the way back by the pool. In Crystal River Florida. To guarantee your place on the boat, you should book your ticket in advance. You can book online. What is the water temperature and do I need a wet suit? The water temperature is 72 degrees year round. Yes a wet suit is required for the trip if you go in the water and we do rent one if you need one. What is the best time to plan my trip? The cooler days between October and March are the best time to see manatees. However there has been a small resident herd (20 to 60 manatees) that have been staying in Kings Bay Year round. Is there a minimum age to snorkel with manatees? No there is no minimum age but parents must use good judgment concerning their children. Children must be quite so not to scare the manatee away. We go in all weather conditions except lightning. On days with lighting we postpone the trip normally only an hour or so. Is it hard to snorkel? No, it is not hard. Most beginners master the skill within a short time. 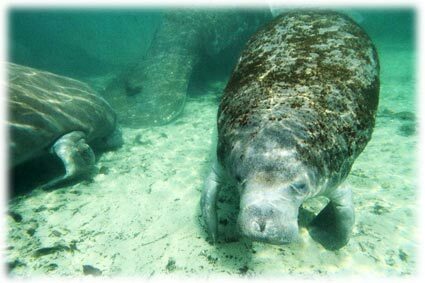 Can I scuba dive with manatees? No. You can only snorkel with manatees. The bubbles scare the timid manatee.